One of the challenging issues, while creating your Website or Blog and start developing, is to get approval from Google for AdSense. Once your blog is approved for placing AdSense ads by Google, you can stay assured and focus upon your content development. Wait, it is not over yet. A next thing you need to confirm is the PIN (Personal Identification Number) which Google send after your blog reaches a 10$ threshold. You need to verify your address and name on the request page and click send my PIN button. People often complain about their PIN haven't reached on time. It may happen due to some postal issue or either they haven't sent it yet. One needs to ensure the data they put into the form and address while requesting for PIN because it is very important to have correct information in the system. If everything is perfect, one must receive their PIN within 15 days of time. Information fields such as House no, Room no or any organization, office and school, Street Address (Clear), Postal Code/ Zip Code of your Area, City Name, Country must be filled correctly. 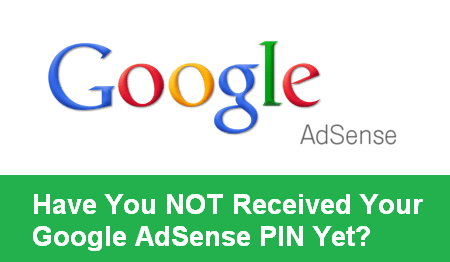 "Best Alternatives to Google AdSense for Earning Online"
Why PIN (Personal Identification Number) is so important? Google AdSense network has a great potential to generate heavy legitimate income through their ad services. Writers and Developers like us do enough hard work making their articles, posts and site content. Google want to ensure the payee or Author must be benefited correctly and in a timely manner. PIN ensures the money or payment cheques goes in owner's hand safely. There are cases identified while people trying to claim other's blogs or sites and trying to get money. PIN takes care of all of those security issues. Well if you lose your blog's or site's passwords, you must immediately take preventive actions. That's totally another issue. Information inserted is correct and there is no mistake in address fields. Request for new PIN. One may need to wait again for three weeks or so. Still, if it is not working for you in some worst case scenario, there is an option for manual verification. Click on the link and you will need to input your publisher ID, name, and other information. In this, you will need a scanned copy of your identification such as passport, government Issued Card or ID which has your name, address, and other things. Just upload these files and wait for confirmation. Google Team will confirm the details manually and mail you about the details. Congratulations, your payment hold is removed and you will never have to enter PIN in future.